Less an album of music than a force of nature, Reign In Blood is a tornado that lands, destroys everything within earshot, and departs as quickly and unexpectedly as it arrived. It's an experience that can only be admired, with the force and fury rendering unimportant any shortcomings in the sophistication of the music. The third studio album from California's Slayer redefined where thrash metal could go. With lyrics drenched with blood, gore and body parts, Reign In Blood became the door through which many bands would travel to more extreme sub-genre's of metal. Slayer themselves remained on the edge of mainstream thrash to keep Metallica, Megadeth, and Anthrax company, but they did occupy the most dangerous corner of that neighbourhood. 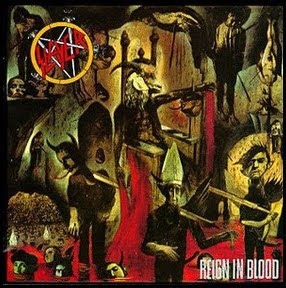 Reign In Blood features vocals spit out in short spurts by bassist Tom Araya, while drummer Dave Lombardo establishes a new threshold for the total annihilation that heavy metal drums can cause. Kerry King and Jeff Hanneman deliver a clinic on fast and accurate thrash guitar work. They push to the borderline between human play and inhuman fast-forward, but for the most part stay within the realm of the possible and melodically enjoyable. The album starts by embracing controversy, Angel Of Death throwing Nazi butcher Josef Mengele straight into the middle of the rumble about whether or not Slayer were celebrating or condemning mass murder of the worst kind. No publicity is bad publicity, of course, and after that opening Reign In Blood follows a trail of dripping blood on a succession of short and shorter tracks, rarely longer than three minutes, all exceptionally delivered but none too distinguished until the final three. Epidemic and Postmortem build to a crescendo that explodes on Raining Blood, one of heavy metal's all-time great tracks. Combining a threatening, interrogating riff with unimaginable power and pace, Raining Blood ends with a massive thunderclap and the sound of quiet red rain that could only accompany a scene of utter devastation. Engineered by Andy Wallace. Mastered by Howie Weinburg.